Beds on Board have top tips to stay on boat. We want you to have the best possible experience. So, whether you are looking for short break of pure relaxation or for a base to explore the landscapes, history, culture and cuisine of a particular destination we have listed some top tips to help you get the most out of your stay. Local knowledge – Most marinas are based in great locations with a good variety of authentic experiences in a relatively small area. When you rent a boat for the night (or more) the best way to make the most of your trip is to speak to the owner (via the message centre at bedsonboard.com) for their local knowledge and tips giving you real insight into the location. Finding the right location is simple. Just search our website for your favourite destinations, choose the boat to fit your budget, sign up and start messaging the owner to find out more. Pay attention to any handover documents – Whether you are an experienced boater or new to staying on a boat, it is always recommended to take notice of the boat’s systems and features which will be outlined in the handover. Its easy to enjoy staying on a boat and just as easy to be a great guest. This will help with making your stay as comfortable and safe as possible. What to pack? – Of course, this depends on where you go on your boat holiday but packing layered clothing will allow you to easily adjust to any changes in temperatures or cooling sea breezes. Remember, on smaller yachts and motorboats space may be limited and so clothing that is ‘multi purpose’ should be prioritised to reduce the amount of luggage and storage required. Suntan lotion! – Staying on a boat is a great way to experience the elements and often people liken it to getting closer to nature. But it is important to be aware of the sun when on the water and always remember to apply suntan lotion. Reflections from the water can also potentially enhance the exposure to UV too. Check the local weather forecast – not only will this help with packing it will assist in planning any itineraries to help you get the most out of your holiday. Speaking to the owner can also help understand the typical weather conditions. We find the weather channel is a good place to check. Sleeping in unusual accommodation – One of the great pleasures of staying on a boat for a holiday is sleeping onboard. The calming sound of waves gently lapping against the hull can lull even the most wound-up insomniac into a peaceful night’s slumber. We suggest keeping your bedtime routine the same as normal to help you to sleep on a boat. Temperature is probably the most common reason for disturbed sleep so it is advisable to familiarise yourself with the boats air conditioning system. Drawing the curtains or blinds in the cabins during the day can also help to keep the temperature down. Food and drink – Marinas are unique places to stay and are often in close proximity to quality, local restaurants so there may not be much of a need to consider food. Most boats are fitted with sufficient cooking facilities for simple meals but we would suggest ‘snacking foods’ and food that doesn’t need heating as a sensible choice. Of course, as far as drinks go, we think there is nothing better than sitting, relaxing on a boat in a marina, enjoying your favourite tipple so make sure you come prepared on that front too! We hope that our you find our tips useful and look forward to seeing you on board soon. We love staying on boats, and we think you will too (here’s our blog post – find out why). Sign up to beds on board and start searching for an alternative accommodation option to a hotel or B&B today. 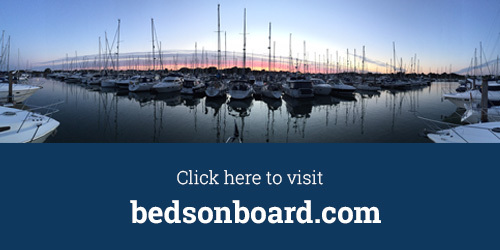 If you have any further questions about staying on a boat for you next holiday, you can check our FAQ’s page or please contact us on questions@bedsonboard.com.